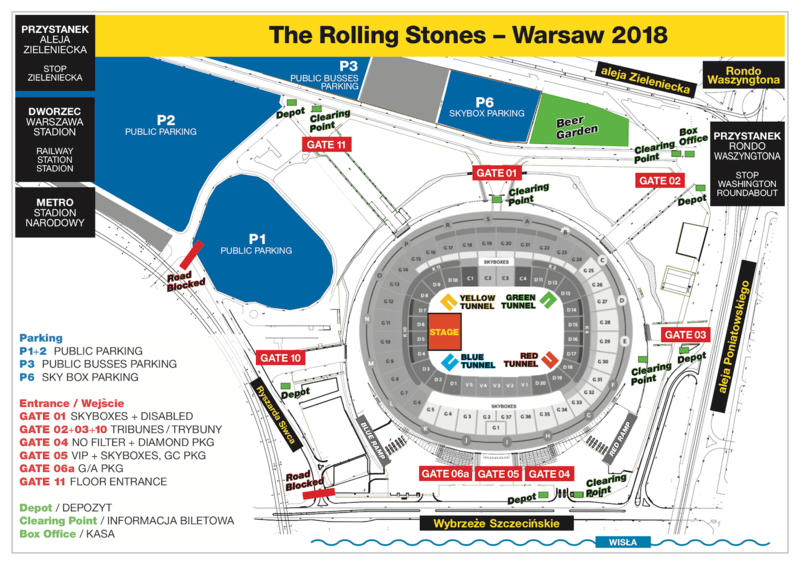 This thread is for live updates and comments regarding The Rolling Stones No Filter show in Warsaw Poland 08-July-2018. The show is expected to start around 8:45pm. Edited 2 time(s). Last edit at 2018-07-08 11:44 by bv. Anyone have info on when box office open and when Stones are expected to hit the stage? Why no vote song for tonight? There will be some surprises since is the last show?? What do you think? just to update travel info. anyone arriving into modlin airport, can get the modlin bus, cost me 35 zloty, around £8. had to buy ticket in airport though. it takes you right into central warsaw and drops off at the palace of culture and science. weather update. sunday morning. sunny and warm. I hope for Mick & Axl singing "Salt of the Earth"
Alternatively, they may simply reduce the setlist to 18 songs because Mick's voice problems, hence no song vote. I hope opening with SMU. And Will the area around be open before 5? Concert-Infos: [www.PGENarodowy.pl] , [www.Facebook.com] , [www.Facebook.com] , [Twitter.com] . Edited 1 time(s). Last edit at 2018-07-08 14:35 by Irix. Lech Walesa wrote a open letter to the Rolling Stones: [www.Facebook.com] . Why no vote song for tonight? Concert-Infos: [www.PGENarodowy.pl] , [www.Facebook.com] , [Twitter.com] . Hard to get the language. Does it say anything on when the box Office opens? Last time they visited Warsaw Poland in 2007, they did not play "Sympathy For The Devil". Tonight we will get it. What time does trombone shorty go on stage? Also, lucky dip pickup starts at 12. If i pick it up at 12, do i have to stay on the stadium or can i go for a walk? And return later on? Any idea when i have better chances for better lucky dips? It says 1700 on the tickets. The English Translation is very basic to say the least. The Polish advice says no professional cameras and the English says no cameras full stop. You’re a keen photographer. Have you managed to get any firm and definitive info out of them? Also it says 15 x 11 cm bags only, yet elsewhere I’ve seen 21x 15 as the stated limit. Anyone? Especially our Polish posters. Also, lucky dip pickup starts at 12. If i pick it up at 12, do i have to stay on the stadium or can i go for a walk? Stones: Just before 9 pm. Its 21x15, they made mistake and later correct it on Facebook, check it. It's a beautiful morning, love Warsaw, really looking forward to tonight's show!! So the small pouches that you put in your waist, should be fine right? The straps that go round your waist do t count. Or do they count? Thank you for that. The English still says ‘No cameras’. If my Polish is accurate, it says no professional filming apparatus. It looks like lazy translation to me or at least I hope so. I had the same problem in Barcelona last year. Fanny packs? The fashion police may detain you. You should be OK, otherwise. ahahahaha. Thank you my friend. Have fun. Expect a safe setlist. I have no rights to beg, but hope you guys get Waiting on a Friend and CYHMK. I don’t care about the Fashion Police. I’ve just put mine on. When Practicaliity conflicts with fashion,the former always wins with me . The Rolling Stones: "Tonight it's the final Show on this leg of the No Filter tour! The Rolling Stones are ready to rock Warsaw - Let's Spend The Night Together!" Edited 1 time(s). Last edit at 2018-07-08 12:48 by Irix.